Woodson antiques has come a long way since it was founded on Woodson Drive in the early 80’s in the garage of Jane and Roy Park. Ten years ago, Blake Craghead and Rick Ingenthon acquired the business, carrying on the tradition at the 1861 farmhouse outside of Kansas City in Raymore, Missouri. “We were both brought up by parents who loved antiques and who passed that love onto us. When the opportunity arose, it was a perfect fit,” Rick says. “We have always loved traveling the world. We travel to Europe six times a year and are always seeking out the next big thing. I love the hunt. There is nothing better than finding that one-of-a-kind piece that will make a client’s house,” he says. In addition to antiques, the design duo takes on numerous projects in the city and has been involved in the designer showcase for the Kansas City Symphony for many years. They also design their own pieces, including lamps from found objects and blue and white porcelain. “Market Hill is an amazing venue. You don’t have to contend with the weather, and you can get a great meal and a glass of wine,” he says. Discover Woodson Antiques at Market Hill. Stacy Graubart grew up in Houston, graduated from Vanderbilt in Nashville, Tennessee, then moved to Paris, France, to study design. She later studied furniture and antiquities at Sotheby’s London. She began her design career working in the costume design industry for film and television, which culminated with an Emmy nod. Midway through her design career, Stacy turned her focus to her real love – interior design. After working for Arlene Semel & Associates in Chicago, she formed SG Designs. For more than 15 years, Stacy has concentrated on high-end residential design and renovation. SG Designs specializes in livable homes, not masterpieces. Her work is very personal, and she spends time getting to know her clients, then creating to their needs and personalities. “I love taking a space that was once unusable for a client and recreating it so that it becomes functional,” she says. Stacy began coming to Round Top more than 20 years ago, first as a collector and now as a vendor and buyer for her clients. “My favorite thing about the show is the thrill of the hunt for special items and being able to see dear friends, clients and vendors that I only see twice a year in the special small town. We love being at Market Hill both as a seller and as a buyer for our design clients. it is not only the best venue with food and places to relax your feet, but is a great community of people,” she says. To see more of Stacy’s work, visit sgdesignshouston.com. Renea Abbott’s life has been somewhat of a treasure hunt. At a young age, she took off to design school in New York City. She would frequent the consignment shops on the Upper East Side during the week and comb the 26th Street Flea Market on Saturday mornings. After acquiring her degree and amassing quite a collection, she moved back down South to open Shabby Slips, a custom slipcover shop that has grown to become one of Houston’s premier interior design businesses. She now has a second shop in River Oaks. “I started making Round Top part of my business plan every year because my favorite place to be is a flea market,” Renea says. “Market Hill brought a more permanent presence to Round Top making it easier for dealers and buyers to shop in good lighting, climate-controlled environment (air-conditioning is much needed! ), and a great restaurant to meet a friend for a glass of wine after the shows. It’s a very comfortable shopping experience, and it is a very eclectic mix of dealers and merchandise – old, new, vintage, antiques and period pieces,” she says. 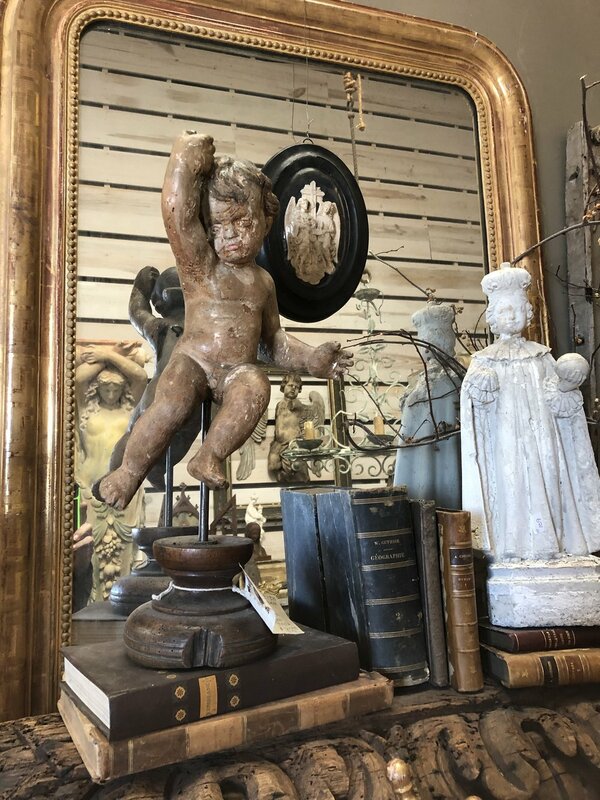 17th century Portuguese Solomonic columns, 18th century wine presses from Provence now as coffee tables, an 18th century Italian stump work embroidery altar facade, a 19th century marble top garden table from Provence and more. Photos courtesy of Provenance Antiques. Provenance Antiques is Yarek, Artur, and Melissa. Provenance celebrates the exceptional, and their mission is just that – procuring the most exceptional and finest pieces possible and sharing them at Market Hill. Exquisite chest of drawers from Spain, 19th Century. Provenance Antiques is based just outside of Nice, France, where they have a warehouse facility, and in Atlanta, Georgia, where they have a 10,000-SF store. Twice a year, they call Market Hill their home away from home. “What the Market Hill experience means to us is family,” Yarek says. “For those who are passionate about fine antiques, inspiration abounds everywhere,” he says. “No matter which day it is, when we receive a container it is like Christmas. There are fabulous pieces everywhere. A very charming and primitive narrow cupboard from the south of France. Soundly constructed from walnut and chestnut with a shaped door panel, terrific hardware, sculpted apron and interior shelving, an outstanding and stunning 17th century Venetian wall-suspended console. The magnificent piece is constructed from polychrome wood with very fine carvings of putti heads. An exceptional and grand scale 18th century northern Italian trestle table/dining table. Superbly constructed from stunning walnut and classical Lyre legs and wonderfully sculpted stretchers. Sensational patina and graining. A truly exquisite table. Back Row Home is located in Houston, just outside the loop off of the Katy Freeway. Two well-known vendors, 2Lucy’s Antiques and Leighton Hall Antiques, own the beautiful 16,000-SF showroom on the “Back Row” of Memorial Design Center. “Our motto is “We only buy what we love,” Kelly says. Back Row Home specializes in antique American and European furniture, architectural and decorative pieces. It is also now a stocking dealer for Lee Industries, Bella Notte and Loloi as well as many others. Owners Tracey Shingledecker and Kelly O’Donnell are always on the hunt for pieces to add to their collection of 18th and 19th century antiques. Their travels will soon bring them back to Round Top for the spring show where they make their home at Market Hill. So, you’ll just have to come see what’s in store at Back Row Home. The man behind The Elephant Walk, Ender Tasci, started his business 30 years ago in Orlando, Florida, and has been coming to Round Top for the last 25 years. Three years ago, he moved his business to Market Hill and he now buys in Europe and Florida for the spring and fall shows. Working for so many years in the industry, Ender continues to find inspiration all around him. “We are in an industry selling beauty and dictating the trends of the future. We deal with very creative and affluent people who take what we saw in a piece and create their own magic. It's all about the passion we have for the industry that defines how successful we are. It’s all about the relatability. People need to be able to see your point of view, and it needs to be current,” he says. Ender is excited about the pieces he’s showing at Market Hill this spring, especially some new modern lighting and mid-century modern upholstered pieces, but he says he’s most looking forward to seeing familiar faces. “My favorite parts [of the show] are reuniting with old clients who have turned into lifelong friends, and meeting new ones. It’s those interactions that keep us motivated to do better and work harder to bring in the best products we possibly can,” he says. Come see the best of the best at The Elephant Walk at Market Hill. For some, antiques fill a room. For others, antiques fill a life. Vikki Vines is one of the latter. Vikki is the top female auctioneer in Texas and, arguably, one of the best in the nation. Vikki started Gallery Auctions more than 30 years ago and has created a worldwide buying experience under one roof. A trip to Gallery Auctions holds the same excitement and passion that Vikki feels for the industry. Vikki has traveled to England, Belgium, Argentina, Spain and France as well as all corners of the U.S. Vikki knows a find when she sees one, and she has a penchant for large items. So much so that she recently moved Gallery Auctions into a bigger space where she has created the Southwest’s largest trade source. Vikki’s son, Jon Goodling, who has grown up in the world of antiques, now works full time at Gallery Auctions specializing in mid-century modern designs. Along with auctions held every Monday, Gallery Auctions continues to grow and to offer new and exciting buying opportunities, including Market Hill. “We are so excited to bring a fabulous mix of items to Market Hill,” Vikki says. When people ask what's unique about Market Hill and its vendors, advertising signs and country store antiques and Don & Marta Orwig come to mind. Located on the center cross-aisle near the food, Don and Marta always bring a huge amount of amazing Americana to Market Hill. "I usually have around 2,000 signs and country store antiques in inventory most of the time. Everything from gas and oil, grocery, farm and factory to great figural trade signs. I deal in about everything that advertises anything," says Don. Among the Americana he has amassed is a huge eight-foot-long hollow anvil-shaped trade sign that in its original life was on top of a three-story brick ironworks factory in Rhode Island. Originally there was a 12-foot-tall mechanical man with a hammer in his hand that would strike the anvil. The man blew down in a hurricane in the 1950s but the anvil survived. Somebody needs to add a 12-foot oval glass top and a set of bar stools to this. You could name your game room ‘The Anvil Bar and Grill.’ You would be the only one with one like it,” Don adds. As for how Don finds all this stuff, he says most are already in collections that resurface on the market. “We only keep these things for a while,” he states. As for his own collection, Don laments that his inventory is his collection. "I want to own a really large amount of things for a really short period of time. My wife Marta says I have a warped sense of humor, but I have this hope that if I'm fortunate enough to go to heaven when I die, I would love to see everything I've ever owned lying along the road as I pass up to the pearly gates and visit them just one more time." In addition to Don and Marta and all those antiques, their friends Polly Hitt from Tyler, Texas, and Gilda Metzler from San Antonio, Texas, will be set up at Market Hill. Gilda who owns Gilded Gardens will have her collection of garden furniture, garden urns and accessories and her amazing plants. Polly, a renowned jewelry designer, will have her "Neck Collections" line of repurposed big, bold and beautiful necklaces and wearable art. Susan Horne Antiques was born out of friendship and a love for antiques. Raised in southern Georgia, her love for antiques and southern hospitality was inherited from her parents. Her father, from Alabama, was an air traffic controller with the Air Force. Her mother, from Manchester, England, loved antiques and anything to do with England, like entertaining and enjoying a cup of hot tea. Susan moved to Dallas and then to Houston with Omni Offices. She met her husband, Houston native Chip Horne, 28 years ago. They have two children, Meghan and Trey. Susan says her business has been successful because of the help and support of all her family and friends. Her son, Trey, is a senior at LSU in Baton Rouge, La., and is Susan's biggest encourager and cheerleader. He calls in at least once a week to ask about the business and how it’s going. When he is home on school breaks, she puts him to work at the Houston warehouse. On longer breaks, you can find him in Round Top working for Susan or sharing dinner with Armando at Manditos. Her daughter Meghan joined her a few years ago and has been a wonderful addition to the business. “Meghan has given a youthful eye to our purchases. She knows what the younger generation wants and that is very helpful to me. I see the younger generation out here shopping and having a great time,” Susan says. Susan shares that she hopes that continues because they are the next generation to make the Round Top Show strong and successful. “Meghan and I continue to travel to England several times a year to assemble an exceptional collection of antiques and one-of-a kind treasures.” They drive the countryside in hunt for these treasures. She says the days are long, and it’s hard work, but they have fun along the way. “I love England and the people we meet make us feel like family,” Susan says. Her next container will be arriving for the Spring Show at Market Hill. Susan's gorgeous showroom at Market Hill is where she brings new life to these treasures. She mixes them with unique new pieces and creates a fresh, new modern look for which she is known. "I really enjoy being at Market Hill. Paul Michael has created a wonderful venue with state-of-the-art amenities.” But more than the amenities, she talks more about the people. When Susan is not in Round Top or England, you can find her at her Houston warehouse located at 9016 Ruland, #A3. Susan says come by for a cup of tea, "I always have the kettle on." Ship’s figurehead from Sicily, circa 1780. From the Bourbon empire when the French occupied Sicily. Stands approximately four feet high. Made as a good luck charm for the ship. She is very beautiful, curvaceous and wearing armor, ready for battle. 40 pieces of pottery service from England, circa 1860. A fabulous pair of square planters by the Swiss designer Willy Guhl. A grand selection of other Willy Guhl, including the diabolo, elephant ear and handkerchief planters. Antique English ironstone pure dairy display slab. These were used by grocers for selling bulk butter and margarine. Highly sought after rare collectibles in original condition – a must have! English chesterfield tufted sofa with elegant lines. A classic piece. Extra large and comfy. Florentine opaque blue and white pottery footbath, circa 1850, a great decorative piece. A nice collection, including a rare red lacquer bamboo étagère from France, circa 1870. Ebonized desk with beautiful brass hardware. Ebonizing is process for darkening wood, giving it the appearance of ebony. Rare wine bottles from Italy, circa 1800, a great backdrop to any bar. From France, circa 1885. Used by seamstresses in the 19th century. It’s getting to be that time of year, when the tents start going up, vendors are hustling to set up, and the fields begin to fill with treasures as far as the eye can see. Round Top is upon us once again. Whether you have lived in Texas all your life, are new to the area, or are just here for the 30 miles of antiques, and haven’t been to Leftovers Antiques, two miles north of Brenham on Highway 290, you are missing out on 17,000-SF of unexpected finds and memorable experiences. Ed Fulkerson and Michael Breddin have been in the business for over 25 years. It is their passion for all things old and interesting that keeps people coming back to Leftovers. Ed and Michael make it seem effortless. It’s not just the uniqueness and grandeur of the antiques they carry, but also the way they keep bringing those elements of surprise and magic to all of their patrons. They mix hard with soft, old with modern, and simple with exotic to create interest, and it works! Another piece they found on their adventures is a Belgian carousel horse. “This is a 19th century original-paint, hand-carved carousel horse, and it is exquisite! It has hand-carved belts and saddle. The detail on this horse is amazing. It was an exciting find!,” Michael told us. Along with the many gorgeous pieces of antiques that came from overseas – tables, stools, chairs, hutches, chests of drawers, lots of shiny copper – they also brought back a detailed set of youth general store fixtures. The small wooden store counter and back cupboard/shelving are 19th century, also from Belgium, with original paint and finish. “It’s fun to imagine the children who got to play and pretend with this. It’s a precious set,” Ed said. Make sure to stop in and meet Ed and Michael, and see their incredible collection at Market Hill or at Leftovers Antiques in Brenham. Jessica Fairbrother, creator of Sacred Heart Antiques, loves what she does. Spending several months each year in France with trips to Belgium and Italy, she is living her dream. “It’s a treasure hunt, pure and simple, complete with racing pulse and surprises at every turn,” Jessica says. Tennessee native Vincent Peach is a jewelry designer and maker who works from his studio in historic Marathon Village, adjacent to his Vincent Peach boutique in downtown Nashville. What results from his creative process is a unique brand of signature pieces containing a mix of Tahitian pearls, brilliant diamonds, precious metals, exotic leathers, antlers, tusks and other natural elements expertly combined in a wearable way. The interplay of vintage and modern, masculine and feminine, bohemian and baroque all works beautifully. While each piece can be considered an heirloom to be passed down to future generations, these aren’t your grandmother’s pearls. They are wildly expressive conversation starters. Each piece is original and a bit out-there, intended for people who have something to say through their personal style. His cult following includes an outspoken lot, like Carrie Underwood, Reba McEntire, Alice Cooper, Steven Tyler, Taylor Swift and Miranda Lambert, to name a few. Currently, the brand is expanding. Maris Collective and Four Seasons Resorts continue to be among the most faithful relationships, but Vincent Peach is building its cache of fine jewelry retailers and specialty stores worldwide. Vincent always brings new pieces to Round Top. Come see what he’s got at Market Hill. It’s also a rare chance to meet the designer himself. To view his collections, visit vincentpeach.com. Round Top veterans Lanny and Lonnie Lenzen began coming to Round Top 25 years ago. “We heard so much about it from friends in the business. We had to see for ourselves what all the talk was about. Long story short, we went and we loved it. The following year, we were vendors out in the fields selling (and, of course) buying merchandise,” says Lanny. Based in Red Oak, Texas, Lanny’s Antiques is known for farmhouse relics and folk art. And even after all these year, Lanny and Lonnie still get excited by the thrill of the find. “The hunt of finding pieces that speak to me and bringing the pieces to the show for my customers. I love when customers come back and show me what they have done with a piece they purchased previously. I just love that connection,” Lanny says. For the spring show at Market Hill, Lanny is bringing a fabulous collection of folk art windmill weights. Folk art windmill weights, also known as counterbalance windmill weights, were produced for the use on windmills from the late 1800s to the early 1920s. A few of the companies that produced the weights were Elgin, Dempster, Fairbury, Eclipse and more. A few of the popular cast-iron motifs were roosters, horses, bulls and letters. The weights were painted black, red, green and blue, depending on the manufacturer. These large weights have become part of the nation’s folk art heritage. Come meet Lanny and Lonnie, and see their windmill weights and other important farmhouse relics and pieces of folk art. Newcomers to Market Hill, Architectural Anarchy will bring an interesting mix of midcentury modern finds, folk art, industrial and architectural pieces and an assortment of old signage to the spring show. “The upcoming spring show will be our first show at Market Hill. We came in for the first time to see it last fall. We love the location, the showrooms, the beautiful collection of unique merchandise,” says co-owner Gosia Korsakowski. Based in Chicago, she and partner William Rawski operate a 30,000-SF showroom filled with a remarkable collection of antiques from the U.S. and Western Europe. Both veterans in the industry, Bill is best known for signs, art and décor he has amassed for Zap Antiques & Props, the Midwest’s largest prop house. Founded in 1987, Zap has been a part of almost every major production filmed in Chicago. It also offers interior design for retail and restaurant spaces and functions as a design studio and print shop. Gosia has been long admired for her vintage home accessories. Growing up in Poland, Gosia spent summers traveling, experiencing different cultures and shopping at various antique stores and flea markets. She says it was always in her nature to be entrepreneurial. In college, she and a friend opened an art gallery and sold art work made by fellow students. She then worked in the fashion industry before getting married and moving to the States. She began collecting and selling glassware and, by 2007, eventually making glassware of her own designs. It was in 2010 that she and Bill went into business together, opening up their warehouse in Chicago, allowing people to shop from their treasure trove of vintage and antique findings from around the world. Now they’ll open it up to shoppers at Market Hill. Be sure to give them a big Texas welcome.